If your home is located in a flood zone, it’s crucial that you take the proper steps to protect your property from potential dangers. Apart from having flood insurance there are several ways that you can protect your house from flooding. If you’ve already faced home damage from flooding, then it’s even more crucial that you understand your options. At Payne Construction Services, LLC we can help recover your home from flood damage as well as offer the appropriate flood prevention services to protect your home from future disasters. If your coastal home is at risk of flooding, we’ve got you covered. At Payne Construction Services we specialize in protecting homes from future flood risks with our home raising and helical pile driving foundation systems. 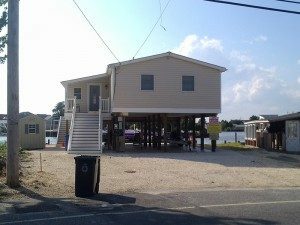 By elevating your coastal home, you’re protecting your structure from becoming submerged by rising water from hurricanes and other super storms and natural disasters. Because coastal homes are built on weak soil or sand, our helical pile driving foundation system is designed to provide a strong base for your elevated structure. Helical pile foundations are a FEMA recognized alternative to timber and pre-casted concrete piles that are also frequently used for coastal flood zones. The benefits of helical pile foundations include cost-savings, minimal environmental disturbance, no need to move the home, they are effective in any soil condition and are resistant to corrosion. If your home was flooded by superstorm Sandy give us a call today. Our business is a part of the Sandy Solution & CHANCE Alliance Network,and as certified installers of CHANCE Helical Pile Foundations, we help to protect your home from future disasters. For more information about our helical pile foundation systems and how we play a role in the Sandy Solution, call us today. At Payne Construction Services, we’re happy to provide the best flood prevention and recovery solutions for your coastal home. For a quote and pricing information click here and fill out our online form.